Janelle has a baby Prairie Dog separated from his family. Oh My! Janelle just received a baby Prairie Dog from the Wildlife Care Network. He is separated from his family and is lost. The baby Prairie Dog is scared and needs someone to adopt him. Club it like you would a baby seal! 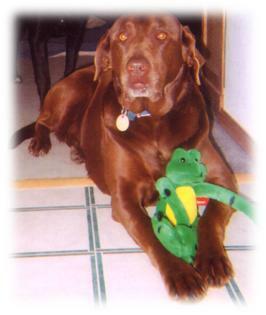 Moka was a beautiful chocolate lab who has been part of the family since I was 13. Yesterday she was put down. She was 13 and she was suffering from arthritis, amongst other things, and could barely walk let alone stand. Below is a poem I wrote. She started her life as a happy, bounding ball of mischief. Her energy knew no bounds. she was a loyal member of the family. just for the sake of protecting her domain. Nothing entered her territory without permission first. a feat not easily achieved. she could really bring out the smiles. or an opportunity to curl up by a warm fire. Scratches behind the ear were pure pleasure for her. No matter what, she knew she was loved. happy and loyal to the end.